The missiles produced by CASIC (and those of Chinese state-owned sister company CASC) are marketed by the China Precision Machinery Import and Export Corporation (CPMIEC). [vi] CPMIEC also promoted several other types of cluster munitions but we have been unable to ascertain whether these were produced by CASIC or by another Chinese manufacturer. This report lists only those cluster munitions of which it could be confidently established they are produced by CASIC. China Aerospace Science and Industry (CASIC) is considered a cluster munitions producer because there is sufficient evidence that it produced several types of cluster munitions after May 2008, notably the SY-300 and SY-400 munitions and the P-12 missile. 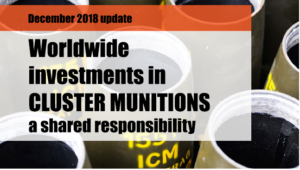 CASIC has not refuted this information, has not responded to PAX’ requests for more information and has not stated publicly that it would stop producing cluster munitions. [i] NTI, “China Aerospace Science and Industry Corporation (CASIC)”, NTI website (www.nti.org/learn/facilities/63/), last viewed 21 November 2018. [ii] China Aerospace Science and Industry, “Introduction of CASIC”, China Aerospace Science and Industry website (www.casic.com/n189298/n189314/c190583/content.html), last viewed 21 October 2018. [iii] Binnie, J., “IDEX 2015: Chinese companies expand guided rocket options”, IHS Jane’s 360, 23 February 2015, viewed 25 January 2016. [iv] Missile Threat, “SY-400/-400 MOD”, Missile Threat website, viewed 25 January 2016. [v] Missile Threat, “P-12 (BP-12/-12A)”, Missile Threat website, viewed 25 January 2016. [vi] Reuters, “Chinese firm under U.S. sanctions wins Turkey missile defence system tender”, 27 February 2013, Reuters website (www.reuters.com/article/turkey-china-defence-idUSL5N0HM42J20130927), last viewed 21 October 2018. [vii] CPMIC company brochure obtained from AAD 2010, on file in the Omega Research Foundation archive. [viii] Binnie, J., “IDEX 2015: Chinese companies expand guided rocket options”, IHS Jane’s 360, 23 February 2015, viewed 25 January 2016.